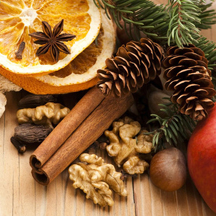 Scent Description A classic blend of traditional holiday kitchen spices, fruits and baked goods: gingerbread cookies, cinnamon, nutmeg, orange & pumpkin with a warm lingering mixture of cinnamon leaf with a hint of vanilla. This fragrance is not skin safe! *Christmas Country Spice is a Bitter Creek South Original fragrance!